Opponents of a proposed fine for some trains carrying coal and oil through downtown were given extra ammunition this week, as an independent legal review declared the proposal in conflict with federal law. 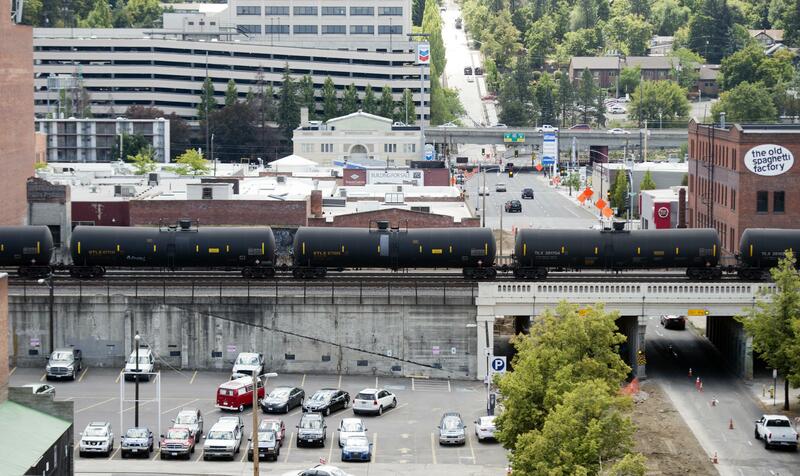 Brian McGinn, the city’s hearing examiner, wrote Tuesday in a memo to the City Council, Mayor David Condon and Todd Eklof, the sponsor of the ballot initiative, that the proposed $261 fine for each car transporting untreated crude oil and uncovered coal through downtown violates at least one federal law regulating railroad traffic. “The effect is to require the transport of these commodities by some other means, or not at all, which will undoubtedly impact the economics of rail operations,” McGinn wrote. McGinn’s findings mimic those of several organizations, including the Association of American Railroads, BNSF Railway and Union Pacific Railroad and even the City Council’s own legal adviser, who say the legislation would create an unworkable patchwork of local regulations for rail traffic. Supporters, including City Council members Breean Beggs and Lori Kinnear, say the fines are necessary to force better safety standards for trains and avoid fiery derailments, like the one that occurred in Mosier, Oregon, earlier this year. Spokane County Sheriff Ozzie Knezovich vowed Thursday to file an injunction if the ballot measure is approved. Knezovich is one of many local Republicans who have advocated in favor of railway development. Beggs, who believes McGinn applied the wrong legal standard in reviewing the proposed measure, said the decision likely won’t have any effect on the language of the proposal or the signature-gathering process. Supporters are eyeing a November 2017 vote on the measure, and would need roughly 3,000 signatures in order to get it on the ballot. McGinn concluded the fines would violate the Interstate Commerce Commission Termination Act, a 1995 federal law that created a new federal agency and gave it supervisory authority over railroads. But Begg argues a 2003 decision by the 9th Circuit Court of Appeals, Union Pacific v. California Public Utilities Commission, gives local governments the authority to pre-empt federal laws to protect local health and safety. Voters were set to weigh in on fining oil trains in Tuesday’s election, but the City Council reversed course, led by City Council President Ben Stuckart. Beggs tweaked the language of the new ban, which targets the oil and coal companies shipping the commodities, not the railroads themselves. Beggs said he hadn’t spoken with Knezovich about his proposal but accused the sheriff of being a “spokesperson” for coal trains. In turn, Knezovich accused Beggs of “political grandstanding” on the issue of climate change by forcing fossil fuels carriers to seek other transportation avenues, but not producers of other volatile chemicals transported by rail, such as ammonia and chlorine. Beggs, who said he supported efforts to reduce carbon emissions, denied seeking to address climate change with the fines, saying his focus was safety by targeting uncovered coal train cars and the transport of oil that combusts at lower temperatures and is stored under high pressure. Knezovich predicted that the fines, if approved by voters, would cost the city’s taxpayers “millions of dollars” in legal fees, after suggesting he might be the one to take the city to court. Beggs said he anticipates legal action, but believes he has the signatures to put the issue before voters. “I would be happy to put my name against Ozzie on this issue,” Beggs said. Published: Nov. 3, 2016, 5:31 p.m.